We interrupt your Carmelo Anthony trade speculation to bring you this Derrick Rose rumor. Multiple teams view Rose as a potential trade target, according to league sources. It would be surprising if the Knicks didn’t get calls about Rose as the deadline approaches. He has struggled on defense and hasn’t distributed the ball well, but he has shown that he’s again one of the best lane penetrators in the NBA. Rose is on an expiring $21.3 million contract, so it’s interesting that there appears to be more than one team considering a deal. The point guard position is incredibly deep, and Rose hasn’t proved to be an exceptional playmaker, adequate defender, average shooter or competent free-throw generator during his time with the New York Knicks. Still, if the Knicks have the opportunity to move Rose for anything, they should do it. Having both him and Carmelo Anthony on the roster is redundant offensively, but also makes it impossible to construct an above-average defense. The two of them are having an adverse impact on Kristaps Porzingis’ offensive development and confidence, and moving one of them would fix a lot of that imbalance. That Porzingis has already shown he can play well with Anthony last season makes Rose the more expendable piece. Though potential return really doesn’t matter, since New York should be letting Rose walk in free agency anyway, the Knicks must be careful not to take on any unwanted long-term salary. 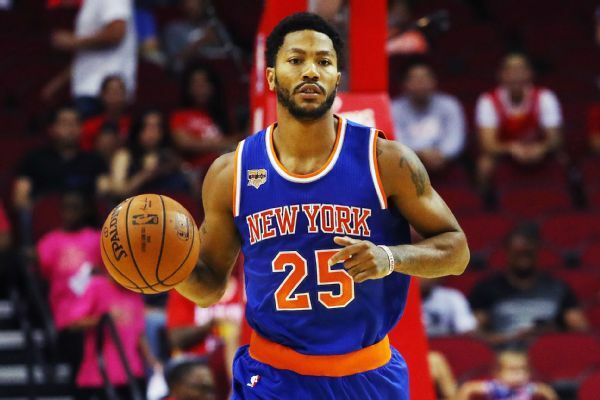 Teams may only be interested in Rose insofar as he allows them to wash their books of a crappy deal, in which case the Knicks might as well let this tank ride out and allow his contracts to come off the books this summer.